The technology of geographic information systems (GIS) for collection, analysis, and viewing of spatial data and their properties has advanced rapidly, impacting traditional geological maps at all scales. The conventional approach of creating geological maps at certain scale seems to be changing, and is being replaced slowly by the principle of extraction of features and attributes - required on one level of generalization or another - from the most detailed original information, together with the development of the computational tools like functions of thinning, resampling, and smoothing options for polylines and polygons. The traditional creation of a global uniform database is considered to be very important, but traditional methods are not the only way. An alternative database is a digital map library (DML). This can be generated for particular areas as an important parallel source of different views and scientific approaches that can be readily used by a wide range of specialists with the help of fast and easy-to-use desktop mapping systems. This is also important with respect to working with features and attributes that vary in both space and time. Users may extract the data they need in current research, starting from the base geographic map, compare them, make a decision, add their own data, make changes, and finally, produce their own new map. Modern multi-layered maps can be developed producing an atlas containing, for example, buried shapes of objects of geological shears, additional paleogeographic information or, at least, a list of recommended relevant data accessible from the DML. Attention is paid to visualization of different information on the map, like descriptions attached to spatial objects, images of rocks, key fragments of seismic lines, etc., using OLE Linking and Embedding, so that the final map appears like a complete report of the area. Explanatory volumes for selected areas are prepared in Hypertext Mark-up Language in the form of a web site to make the GIS data available to the international community for scientific and educational purposes. Complementary raster-based animated sketch maps and three-dimensional models and sections are used to visualize spatio-temporal data when trying to make geology more understandable to the general public. The purpose of this paper is to show few activities of installation of some computational techniques in the bedrock geological mapping and using its results, as it is seen from the point of view of geologist. It does not pretend on the wide scope of this huge problem. All stages of the geological mapping have long history, traditions and rules, especially for the creation and getting up the governmental geological map series at certain scales. First attempts of preparation of new generation of computed maps were aimed mostly on the digitising of a hard paper copies. Resulting digital versions were used mostly for printing and correction purposes, being isolated from geologists either by special formats, or by the necessity of the long education curve. However, with the growing use of graphic workstations and personal computers, and increased role of the Internet and Intranet, development of a new geological mapping strategies with increased involving of computational techniques is on the rise. Serious now-a-day efforts are aimed on the creation of a global uniform database, and on progress of a true easy-to-use distributed computing environment. The compilation of such database in progress is very important work, but at the moment effective using of the results is not obvious. In addition to common technological problems, like the active location update scheme and failure restoration, or dynamical reaction to changed network states, the geological science brings its own. Some of them are constant updates in stratigraphic division and correlation, numerous and often contradictory interpretations, data scarcity, geological variations, different methods used in field data collecting, role of competence and experience in geological mapping that can not be estimated in the uniform database at the moment. The parallel approach is to install relevant computational techniques in solution of everyday tasks of all geologists with the help of desktop GIS software packages, to organize digital data exchange, and to share principles and methods of effective use in different geological situations. It is realized by creating the digital map library (DML) and complementary datasets in formats readily accessed by uses of different software, who can start from the base geographic map, perform SQL query, find and extract the data they need in current research, compare them, make a decision, add their own data, make changes, and finally, produce their own new map that will be added backwards in the DML. DML is combined to help geologists to create the preliminary geological base map from a CD-Rom during the field work either, when the network is unreachable. That is important to have such preliminary model, translating location of observations on it, adding new records and correcting immediately in the field. Different portable software packages are used with DML, in dependence of everyday jobs. ESRI and MapInfo products are common, GeoDraw - GeoGraph GIS package of the Academy of Sciences of Russia is in use either. In recent investigations Golden Software products ( Didger 2, MapViewer and Surfer 7 ) were tested, and this software shows stable work and ability to solve numerous geological tasks very effective. Graphics of this paper was prepared from different types of the maps created using Golden Software packages. It is important to notice user-friendly interface, allowing to produce base maps, thematic maps, contour maps, etc., or to perform 3D Surface mapping and different computations without long training and assistance, that is urgent for geologists without special GIS education. Principles of geological mapping of different areas have been generated in decades, and there is no reason to refuse from them, but the task is to involve computation in all steps of this process. However some conventional approaches, like creating geological maps at certain scale seems to be changing. Of course, when the detailed information exists, it is not more actual to re-digitize spatial data. Many efforts are aimed to automate extraction of features and attributes - required on one level of generalization or another - from the most in depth data, with attention to both gridding and mapping options. Different methods are used. For example, spatial DML data in the form of points, polylines and areas, like geological boundaries, can be extracted easily in relation with area and code that stores the range of the division either. Local utilities allow to resample boundaries, with breaking and extracting the required fragment. Functions of criteria extraction, thinning, and smoothing for polylines and polygons can be performed in numerous GIS - related software. The image above illustrates simplest elements of graphic generalization in Didger 2, performing criteria extraction (measured properties - area) first, and deleting areas less then "n" square kilometres, with further vertex averaging thinning, and final smoothing of a reshaped boundary. General principles of the DML are simple and probably more or less common: there are storages of data, grids, and mostly thematic boundaries converted in Latitude/Longitude (decimal degrees), with additional comments about the authors, year, source map, original scale, brief description, opinions. For the MapViewer users, major spatial data (that supposed to be most updated) are arranged in complete base maps with the mentioned comments, because it is simple to select any boundaries from the "List" by ID, and transfer them on a new map easily with the help of the possibility to export "selected objects only". 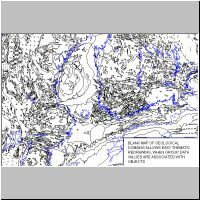 Such multi-layered maps exhibit simple geological atlas containing, for example, buried shapes of objects of geological shears, additional paleogeographic information or, at least, a list of recommended relevant data accessible from the DML. There are complementary maps in the DML called "Transformer" Maps. Their aim is to promptly inform about the general features of the geological and tectonic situation. To perform that, for some regional maps of large areas, special blank base map (containing the most possibly updated data) with linked worksheet has been designed to obtain quick and simple transformations that allow creation the set of thematic maps, linked with a shape of geological bodies and domains. In this arrangement the principle that some thematic geological maps follow the same contours is used. Geological bodies and areas of distribution of rocks are grouped in classes to link to data using major code that can be not unique, but the same to several objects of "geological families", say to the rapakivi granites formed in the same age interval. It is more effective with a possibility to use both major (group) code or individual unique one to obtain possibility to link averaged data of the class, or information stored to an individual object, by choice of geologist. If the user does not agree with the code or property value, it is very easy to change. In the MapViewer the arrangement can be effectively realised as a Hatch Map. Users may easily reorganize map selecting different variables. For example, "Geological Map" allows to redraw blank map into a geological one, while different ("user defined") specification of number of ranges may regroup "geological families" with their joining when decreasing a number of ranges, or backwards. Specification of a single range type with determined number enables to fill by colour only required group of geological objects. For such map it is better to use manually assigned common colours instead of gradational ones. Additional pre-defined variables allow to assign a colour spectrum to the first-order stages. Say, the variables subMAP of the AR-PR basement, subMAP of sedimentary cover, subMAP of Caledonian belt for the Fennoscandia and adjacent areas allow to make colour / pattern fill of groups of this stages only. Other variables of "Transformer" Map include the Tectonic Map, Isotopic Age Map, Hard rock type Map (Petrographic Map of the crystalline rocks), Sediment type Map (Lithological Map of the cover), Erosional resistance Map, and some others. Some principles of this map type are illustrated in the fragment of the Geological Map of the Fennoscandia and Adjacent Areas (A. Amantov, Rogaland Research Special issue, report no. 1998/380, Stavanger, Norway). The geological practice knows numerous examples, when intuitive mapping and forecasting based on experience and knowledge of the region, gave perfect results than can not be underestimated, and one of the additional task of DML creation is to find keys and mechanisms of its description. 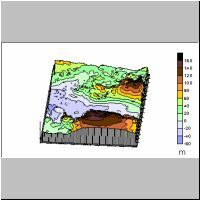 At the moment, partial automation with creating of several preliminary models is usually performed for the platform areas, where it is more or less easy to forecast strata bedding and lateral changes, even in the case of poor data. Outcrops or subcrops of mapped divisions are getting as grid-produced intersections of surfaces of the sole of the mapped unit and the bedrock topography. Worse results are typical for the areas strongly affected by faulting, or with dissected bedrock surface and thick Quaternary sediments, like the Baltic Shield's margin, where the experience of geologist allows, for example, to forecast the behaviour and form of deep glacial tunnel valleys. However, the modelling gives satisfactory draft in this case either, as shown on the picture. The gridding and relevant computations were performed using Surfer 7, where the process can be automated using the Scripter Basic Language. Gridding with account of the fault lines and possibility to use variogram grid approach should be mentioned among numerous new useful advanced features of this software. There is one major principle in use: the digital map should help the user not from the paper, but directly from the monitor. Attention is paid to visualisation of different information on the map, like descriptions attached to spatial objects, images of rocks, key fragments of seismic lines, etc., using OLE Linking and Embedding, so that the final map appears like a complete report of the area. This principle is reproduced for the WWW either, in the most simple form turning a GIF or JPEG image (produced from the original map) into a clickable map by designating "hotspots" of polygons, circles and rectangles within the image and specifying a URL for each to link to, and to open in a new floating window. Explanatory volumes for selected areas are prepared in Hypertext Mark-up Language in the form of a web site to make the GIS data available to the international community for scientific and educational purposes. 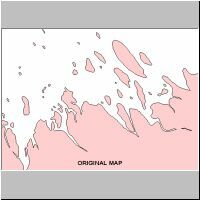 Complementary raster-based animated sketch maps are based on the original layers of the digital vector maps. Animation seems useful to illustrate the pattern of transgressions - regressions, erosion activity, pattern of changes of the exhumed and epigene surfaces of the bedrock topography, retreatment of scarps in geological time, etc. For example, the following picture was produced from the real map of the bedrock topography of the eastern part of the Gulf of Finland, originally combined in the MapViewer. 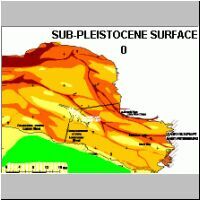 It illustrates supposed animated model of the Upper Pliocene - Pleistocene erosion and the development of glacial tunnel valleys in the Vendian platform sediments, when different height levels and (or) surfaces are shown by colour fill, while figures indicate age. Usually all animations of such kind have Java Script control of speed and possibility to stop and continue from the required image of the sequence. The other example is animation of the Barents Sea basin and high pattern with average vertical motions of structures. It is based on the MapViewer Prism Maps, when variable height prisms represent different average values of the basement during several stages. More complicated sketches exhibiting horizontal displacements involve additional layers with rearrangement of areas of the Base Map. Three-dimensional models and sections, based on grid produced 3D surface mapping, are used to illustrate geological, geomorplological and tectonic features of the area. This rotated model shows the relief pattern of the eastern part of the Gulf of Finland and adjacent onshore areas. Original models were prepared using Surfer 7. Such models are more effective with drawing additions of geological sections on "sides". In the following example they mark the erosional origin of major landforms shown. Rotating models of such kind may display lateral differences of the geological situation, but their preparation takes some time. However such illustrations seem to be effective additions to faster comrehension one or other "key" area to geologists, and to make geology more understandable to the general public. The author is grateful to Rogaland Research and especially to Willy Fjeldskaar for the help with the equipment and software. Connie Wedgeworth provided valuable assistance and technical support with the Golden Software packages.